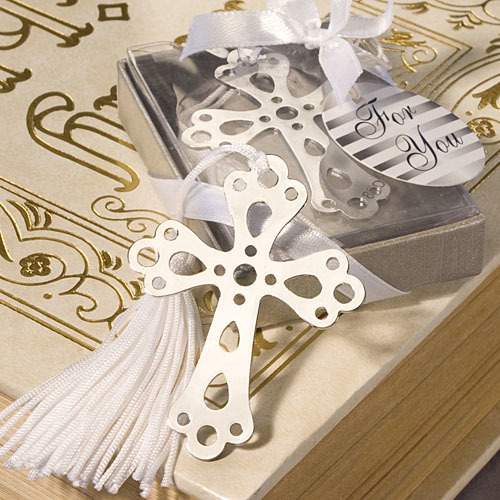 If you are looking for First Communion bookmarks or perhaps cross Baptism favors, these beautiful cross bookmarks are lovely gifts that are not only useful, but they are gentle on the pocketbook too. And, they arrive beautifully gift packaged and ready to be given to your guests. Our lovely bookmarks, including their tassel, measures 5 1/2" by 1 1/2". The bookmark itself is silver metal and features cutout details. They are individually packaged in a showcase topped box with a silver base, then tied with a white satin bow. Finally, there is an attached round “For You” tag with a silver and white striped design. Please allow us 5 business days to fulfill your cross favor order; then add ship time from NY.